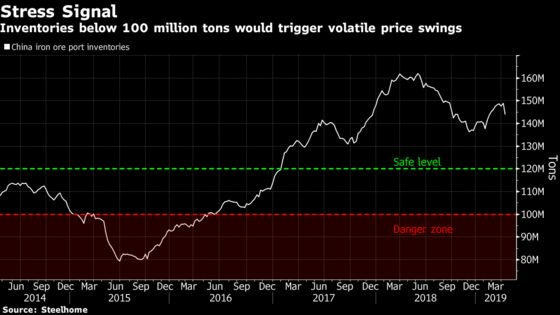 (Bloomberg) -- China’s steel industry, the world’s largest, isn’t prepared for a looming shortage of iron ore in the second half that’s set to drive prices higher, according to a prominent industry adviser, who warned of devastating volatility should mainland holdings sink below 100 million tons. Prices will “absolutely” continue to rise as mine closures in Brazil spur a deficit, Wu Wenzhang, founder and president of Shanghai Steelhome Information Technology Co., said in an interview. Mills in Europe and the Middle East will be in a worse position than China’s in the event of a prolonged shortage, he said. The global market is reeling from a January dam disaster at a Vale SA operation that triggered a sweep of mine closures across Brazil and boosted prices to the highest since 2014. Shipments from the South American nation are collapsing, while Australian disruptions and signs of a pick-up in China’s steel demand offer a further boost to prices. So far, mills in China have played down the potential disruption, saying supplies will pick-up elsewhere. “They don’t realize what’s going to happen,” Wu said on Saturday on the sidelines of Steelhome’s conference, which attracts about 1,000 delegates from around China. The disruptions will amount to 60 million tons of lost supply this year, according to his “conservative” estimate. “The only thing we can do is try to convince the steelmakers to believe what could happen with iron ore supply, and to prepare for the upcoming shortage,” he said. Wu says he’s watching stockpiles for signs of stress, with any slide below 100 million tons likely to trigger “devastating” volatility. Inventories sank 3.4 percent to 143.9 million tons in the week to April 12, according to Steelhome’s own data on Monday. The safe minimum is about 120 million tons, Wu said. The benchmark price of spot ore climbed to $95.90 a ton on Friday, rising for a fifth straight week, according to Mysteel, and aiding top suppliers BHP Group and Rio Tinto Group. Citigroup Inc. has forecast that a looming supply crunch will drive the commodity to $100. Iron ore mines in China have limited capacity to plug any supply gap, given environmental constraints and high costs. If prices stay above $100 a ton, China miners may ramp up production. While China’s steel prices will continue to rebound into the second half of the year as the economy stabilizes and demand recovers, average rates over the year will be lower than 2018. Wu noted the solid credit growth in the first quarter.